SPECIALLY PRICED WHITE SOX TICKETS! The White Sox have dedicated this game to all those that serve and protect our Country. On this special day, the White Sox would like to offer specially priced tickets to all past and present members of the military, law enforcement, and fire protection, their families, supporters and friends. Please note that orders will NOT be redeemed at the U.S. Cellular Field ticket windows or the White Sox administrative offices. CHICAGO (CBS) – Local veterans expressed anger on Tuesday after the head of Veteran’s Affairs compared long wait times at VA hospitals to lines for amusement rides and Disney. That didn’t sit well with some of the 700,000 or so Illinois veterans. Balcer was one of more than a dozen vets who gathered days before Memorial Day to discuss their needs. The two candidates for the U.S. Senate in Illinois were both unhappy. • Sim is among about 9.7 million Veterans—more than 44 percent of all Veterans—who are 65 or older. 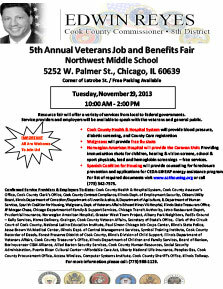 • Veterans of any age may qualify for VA benefits, including health care, home loans, and pension. Veterans, may also be entitled to VA support. • We’re equipped to care for you. Through, geriatrics, extended care, home health aide and care services, telehealth, and other programs, VA addresses Veterans’ complex health and personal care needs in home and community-based settings, and at VA medical centers. • We can bring care to you. VA has many options for older Veterans to receive care at home, avoiding regular trips to the doctor or longer stays at medical facilities. With home-based primary care, for instance, eligible Veterans enrolled in VA healthcare services can receive certain health services at home. • We provide you with tools to cope with vision loss. With therapy and cutting-edge assistive technology, Veterans who are legally blind or who have low or damaged vision can stay active. VA’s blind and vision rehabilitation programs, available through outpatient clinics, intensive training, and home care, make it easier to live with poor eyesight. • We increase your options. If you’re eligible for or receiving a VA pension, larger monthly payments may be available under the VA pension aid and attendance and housebound programs; for instance, if you need help performing daily functions or you cannot leave your house due to a disability. • We protect your VA benefits. If it’s hard to manage your VA benefits due to injury, age, or disease, the VA fiduciary program can find and appoint someone to help handle your affairs. • We support those who care for Veterans. VA offers resources to help caregivers stay strong and organized on behalf of Veterans, including a free six-week online workshop for family members called “Building Better Caregivers.” Call 1-855-260-3274 for information on other VA caregiver benefits. VA also offers several forms of respite care services for caregivers who need a break. 2014 Veterans Day discounts, free meals, deals and sales. As Veterans Day approaches we will continually update this list as restaurant’s and companies announce their Veteran’s Day specials. Typically most announce a week or days before. Veteran’s Day is officially Tuesday, November 11, 2014. Link below. THE NOSTALGICS Dinner Show and Overnight Package, Saturday, November 9, 2013. 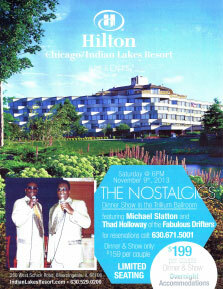 Hilton Chicago\Indian Lakes Resort cordially invites you to a night of magic with The Nostalgics, featuring Mike Slatton & Thad Holloway, including a special appearance of the Fabulous Drifters. $199 per couple for dinner and overnight accommodations, $159 per couple dinner only. HALF PRICE FOR VETERANS AND ACTIVE DUTY SERVICE MEMBERS. 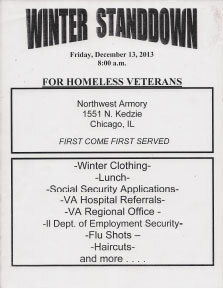 Email info@coalitionofvets.org in time that you have registered, and get a free breakfast. 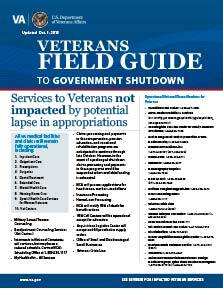 Please download the guide, that explains which government services for veterans will be available and which ones will not during the government shut down. Many VA Hospital services will be available; many Regional Office services will not. Please take a look at the guide for specific information. 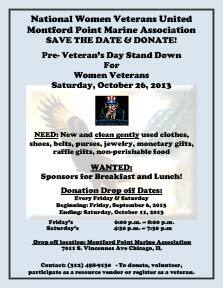 SAVE THE DATE & DONATE! 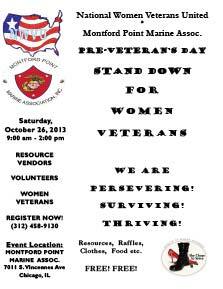 participate as a resource vendor or register as a veteran. Resources, Raffles, Clothes, Food etc. Sponsors for Breakfast and Lunch! 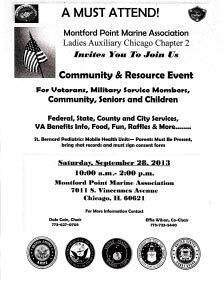 Friday’s 6:00 p.m. – 8:00 p.m.
VA Benefits Info, Food, Fun, Raffles & More…. Bring shot records and must sign consent form.